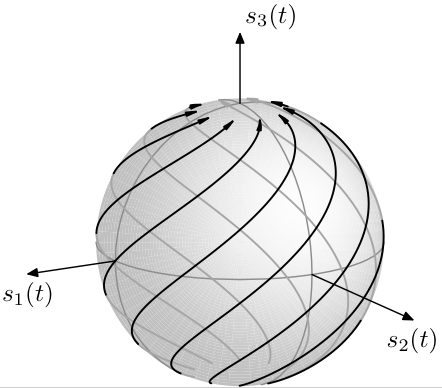 A program for the visualization of trajectories of Stokes parameters on the Poincaré sphere. The program generates MetaPost code as output. 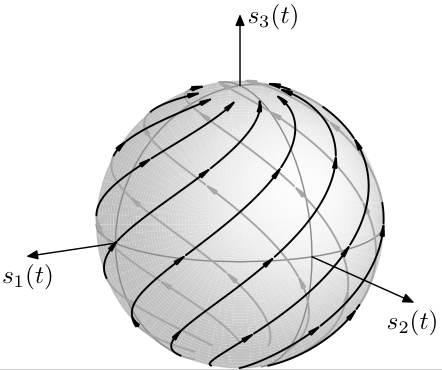 The Poincare computer program creates topographic maps of Stokes parameters , visualized as trajectories on the Poincare sphere . The Poincare program generates MetaPost source code as output, to be compiled into PostScript or Encapsulated PostScript , using John Hobby's MetaPost compiler or anything that understands the MetaPost syntax. I have used the Poincare program extensively in my research career, and the program has been continuously updated for almost nine years by now, in fact the oldest program I keep active in my stock. This program was used in the generation of the image that made it to the front page of issue 4 of J. Opt. A: Pure Appl. Opt., Vol. 2 (July 2000). Revision 1.23, as of 24/01/2014. Copyright © Fredrik Jonsson 1997-2014, under GPL. poincare.c [140 kB] ANSI-C (ISO C90) conforming source code for the Poincare program. Compile by 'make' and run 'poincare --help' to get a listing of the available switches and options in the terminal window. Makefile [10 kB] The Makefile for compilation of the executable file, and for generation of the examples, simply by executing 'make examples'. To compile the executable and documentation, simply run 'make' in the directory containing the source files and this Makefile. View the contents of the Makefile to get an idea of how typical applications of the Poincare program are implemented. poincare.tar.gz [33 kB] Gzip:ed tape archive of the entire Poincare program directory, including the ANSI C source code and Makefile needed to rebuild the program and example images from scratch. Figure 1. This is an example of a Poincare map of a spiraling helicoidal trajectory of Stokes parameters (artificially generated by an AWK script). The hidden parts of the trajectory is drawn as solid gray, and labels for the components of the Stokes vector (s1(t),s2(t),s3(t)) are displayed at the corresponding axes. #    displayed at the corresponding axes. Figure 2. 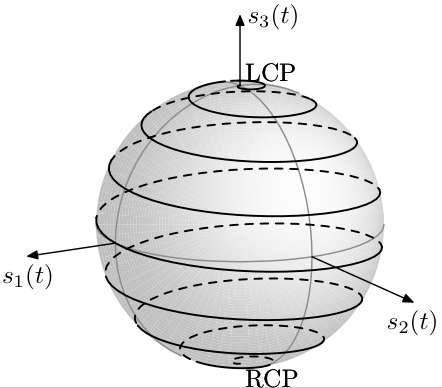 This example is similar to the one in the previous figure, but now with labels added at the beginning and end points of the trajectory (LCP and RCP, indicating the poles of left and right circular polarization states, respctivelty). These labels are added with the '--axislabels' option in the listed block of the Makefile. In addition, the appearance of hidden parts of the trajectory has been changed to dashed black, using the '--draw_hidden_dashed' option. #    parts of the trajectory has been changed to dashed black. In this example, several trajectories are mapped onto the same sphere. 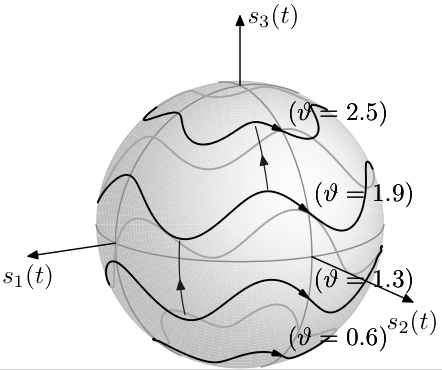 This is something useful for illustrating, for example, wave propagation in isotropic media, in which case the form of the Stokes trajectory is invariant under rotation around the s3-axis of the coordinate system (s1,s2,s3). Figure 3(a). Multiple paths of trajectories mapped on the same sphere. In the basic configuration, each path will be draw by a single arrow indicating the directionality in traversing each path of the Stokes vector. Figure 3(b). Same map as in previous figure, but now with the path arrows chopped up into several segments. Figure 3(c). Same as previous figure, but now with the arrows reversed, using the '--reverse_arrow_paths' option. Figure 3(d).The effect of using the '--draw_hidden_dashed' option. Figure 4. This example illustrates a set of closed trajectories, each being constructed out of concatenated pieces so as to create a plurality of arrow heads in each cycle. This example also illustrates how additional indicatory arrows may be included in the map by using the '--arrow' option repeatedly. #    in the map by using the '--arrow' option repeatedly. Figure 5. 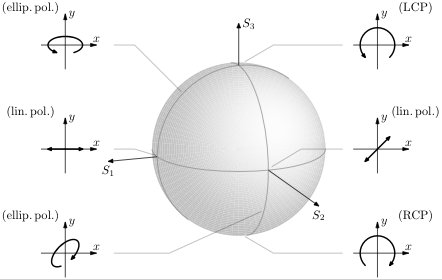 The following example of an application of the poincare program is taken from my PhD thesis, and illustrates how to append MetaPost code to the generated Poincare map, in this case an illustration of the interpretation of various parts of the Poincare sphere in terms of the polarization states, illustrated as the paths the point of the electrical field vector describes as one looks into the oncoming wave. In this particular example, the MetaPost code in the file 'polstate.mp' contains all illustrations of the polarization state interpretation, and is appended via the 'input polstate.mp;' statement in the end of the generated file 'stoke.mp' (by using the '--auxsource' option when invoking the poincare program from the command line), which serves as a master source file when compiling the figure. J. D. Jackson, Classical Electrodynamics, 2nd Edn. (Wiley, New York, 1975). 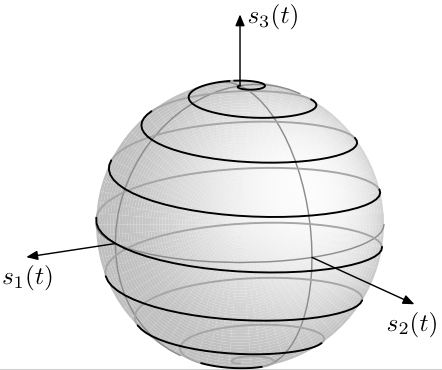 The Poincaré sphere is classically denoted so after the French mathematician Henri Poincaré who in 1892 introduced it in his Théorie Mathématique de la Lumière, Vol. 2, Chapter 12, Pages 275-306 (Gauthiers-Villars, Paris, 1892).